Posted January 2nd, 2018 by The Antique Register & filed under Featured Shops. 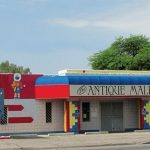 Located in the heart of Tucson’s antique shopping district, American Antique Mall has been popular with local, national and international shoppers since its opening in September 1993. The multi-dealer mall—Tucson’s oldest—has a well-deserved reputation for offering quality items from top dealers. Although filled with a variety of offerings, the mall’s main focus is concentrated around Southwest antiques. The extensive collections include: Native American Indian Art and turquoise jewelry, Southwestern books, old postcards, mining and Western items. 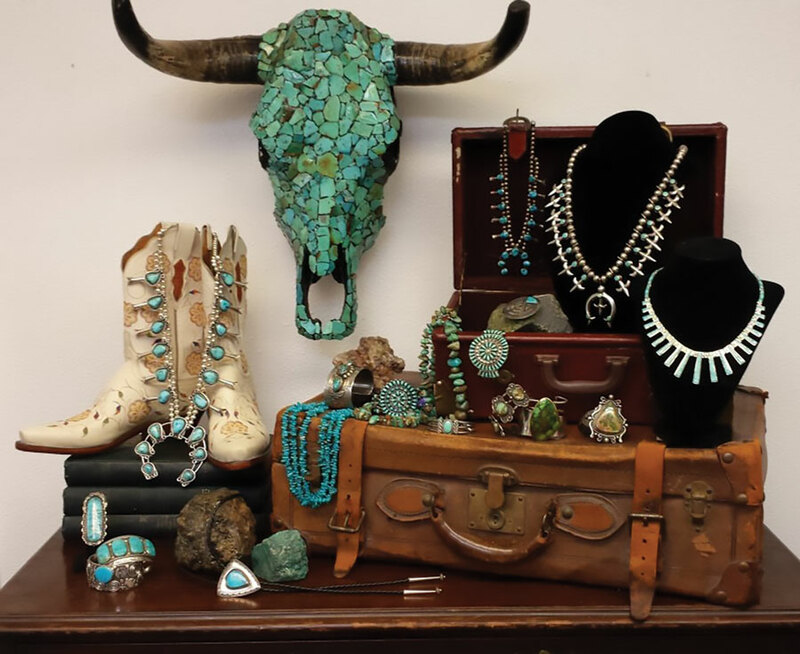 There is a vast selection of turquoise jewelry (squash blossoms, bracelets, rings, earrings, Concho belts and bolos) including Fred Harvey era jewelry, 1930s Native American baskets, vintage Navajo rugs plus a lapidary shop with rough turquoise and turquoise cabs. Also offered is quality artwork, including Western paintings and antiques from old Mexico, antique furniture, Oriental items, old American coins, vintage electric fans, typewriters, military, old medical items, old postcards, photos, tintypes, old cameras, and “man cave” items like road signs and license plates. American Antique Mall Owners Dwight and Christy Schannep interests in antiques began early in their lives—Dwight as a rock and minerals collector and Christy having inherited her family’s love of antiques. He has a business degree from Northern Arizona University and she has a Master’s degree in Counseling and Rehabilitation from the University of Arizona. After working in their own fields, the two decided to leave those careers to pursue what they both loved—the antique business. Dwight and Christy started off doing weekend yard sales, selling antique items they had collected and restored—an enterprise that was wildly successful. Their next step was owning and operating their own shop, Elephant’s Trunk Antique Emporium, from 1990 to 1993. The mid 1990s were a time of steady growth as consumers reestablished an appreciation of antiques and collecting creating an exploding popularity with the advent of PBS’s “Antiques Roadshow” and the beginning of eBay. Customers would compliment the couple for the unique items in their small shop but would ask where the big antique malls were in order to maximize their antiquing in Tucson. At the time, there were only two malls—one large and one small, both now closed—so the Schanneps decided to establish their own. In preparation, Dwight and Christy traveled across the Midwest in 1990 to go antique hunting and also check out the best antique stores to see what they liked or did not like about them. They also explored potential locations around Tucson and were excited to find a 7,500 square foot building on Grant Road, centered in the area’s largest concentration of antique shops. They opened the American Antique Mall on September 1, 1993, at 3130 E. Grant Road on the southeast corner of Grant and Country Club and immediately filled it with dealers. Dwight says, “We are positioned in the hub of Native American Indian jewelry, as the Navajo, Hopi and Tohono O’odham nations are in our state. Zuni and Santo Domingo pueblos are located just Northeast of us in New Mexico. 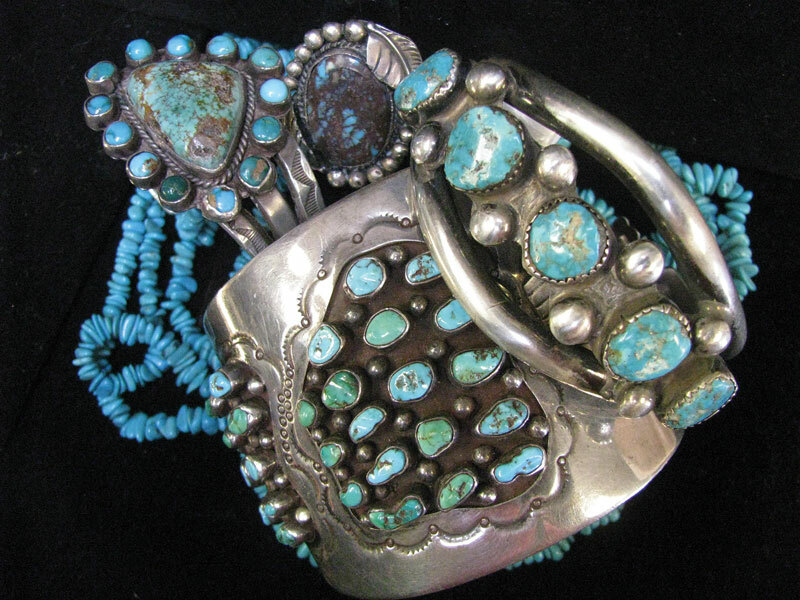 Collectors buy American turquoise from us because they know it is authentic. Bisbee, Morenci and Sleeping Beauty turquoise mines are all located about 100 miles from Tucson. Even though these mines are no longer in operation, our close proximity and our extensive knowledge and experience with turquoise draw collectors and jewelers to our location from all over the world. “Bisbee turquoise is identified by both its inherent colors and accompanying lavender/brown matrix. Morenci turquoise is known for its vivid blue color and accompanying shiny pyrite. Sleeping Beauty is known for its consistent blue color and lack of matrix or host rock. Kingman turquoise, Arizona’s last producing turquoise mine, is a little trickier to identify. Kingman has been identified in over 30 colors and comes in different natural patterns, including spider web and water web. More turquoise information can be found on our website: Tucson Turquoise.com. “Having extensive experience cutting and selling Bisbee turquoise, authenticity is of great value to our customers. Customers can buy turquoise from Arizona within a 100-mile radius of the original source. It has been my observation that a substantial amount of “Bisbee” turquoise offered on the internet is fake, due to either the seller’s lack of knowledge or outright fraud.. True Bisbee turquoise is valuable, priced up to $20.00/carat. Buyers apparently don’t notice that many “Bisbee” turquoise sellers online are selling from China and India. 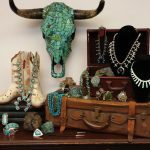 “We sell Arizona turquoise to people from around the world, particularly during the Tucson Gem and Mineral Show, which has been held in Tucson every February since 1955. Recently, we have had a number of residents from Hawaii who have purchased turquoise from us. Turquoise is typically found in the top 100 feet of soil accompanying copper sources in dry, arid areas. “The bolo tie is Arizona’s official neckwear. Wedding guests, both local and out-of-town visitors, buy bolo ties to wear to weddings. Customers find bolo ties to be nice alternatives to traditional fabric ties. As with all Native American Indian jewelry, what determines the price of the piece of jewelry is the artist, intricacy of detail, quality of turquoise, and popularity of the particular style of piece. Tucson is home to the Tucson Gem and Mineral Show, the largest of its kind in the world. This show lasts for two weeks for wholesale-only customers and ends in a large show at the Tucson Convention Center, which is open to the public. Every hotel around the freeway has its own distinct venue such as fossils, petrified wood, etc. A few hotels and shows along the freeway welcome both retail and wholesale buyers, but you must have a resale tax license to buy wholesale. If you had two weeks to spend in Tucson, you could not see everything! The Schanneps are fortunate enough to know Dan Caudle, one of the two original Tucson Gem and Mineral Show founders, who is now in his mid 90s. Through their local lapidary club, they are also friends with Mark Clayton, the son of the other original founder. Their story can be found on tucsonturquoise.com and includes both a typewritten manuscript and a video filmed several years ago. 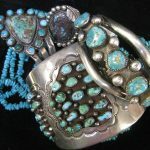 Dwight and Christy are both accredited appraisers and perform appraisals all over the country, via the Internet, of turquoise and Native American Indian turquoise jewelry, as well as fine art and general antiques. Locally, they also perform antique and personal property appraisals through their company American Heirloom Appraisers. American Antique Mall is open Tuesday through Saturday. The mall is closed for extended periods of time during the summer when visits to Albuquerque, New Mexico, Native American Indian art shows, as well as other nostalgic trading posts and points of interest across the Southwest fill much of the Schanneps’ summers. To learn more, go to www.americanantiquemall.com, http://tucsonindianjewelry.com, Like or Follow American Antique Mall on Facebook, email dwightandchristy@gmail.com or call 520-326-3070.